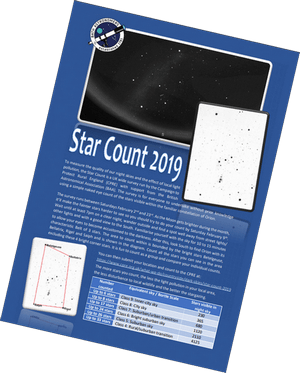 Are you going to get involved in Star Count 2019? It has been a few years since the Campaign to Protect Rural England ran a national census of the sky darkness. The Survey is open to all and runs between 2nd and 23rd February. Due to the Moon, it is best to have your count before 9th February. The event is supported by the British Astronomical Association and hopes to gather data on the current light pollution levels in the UK but also raise local awareness of the problems of bad lighting – impact on wildlife and human health, waste of energy, its false sense of security and, for us and our children, the loss of one of the most beautiful aspects of nature and our world. You can download our handout here.